Patrick Regan (1938–2017) in his book Advent to Pentecost (2013) called the Fourth Sunday in Lent the “turning point” of the season (page 86). Current research has shown that in Rome, before the fourth century, there was originally only a three-week season of preparation of those seeking to be baptized at Easter. Elsewhere, a three-week period of preparation for baptism was not uncommon, whenever baptism was celebrated during the year. In the sixth and seventh centuries, this three-week period was expanded by monastics following the example of churches in the East, which for several centuries had observed a forty-day post-baptismal fast. Regan quoted Maxwell Johnson’s summary of what we know and don’t know about the origins of Lent, “The forty days of Lent represent a synthesis of two traditions, both of which are baptismal in origins: the forty-day Alexandrian [Egypt] post-Epiphany fast [imitating Christ’s postbaptismal fast], and a three-week baptismal period elsewhere. In its origins, therefore, ‘Lent’ has nothing to do with Easter at all but everything to do with the final training of candidates for baptism” (page 88). In time Lent will become a season of penitence for the baptized—that’s another complicated story, one for another time. Adolf Adam (1912–2005) in The Liturgical Year (1981) noted that the traditions we associate with the Fourth Sunday in Lent—rose-colored vestments and the use of flowers and musical instruments—are unknown before the sixteenth century. Adam concluded that the customs arose from a local celebration in the city of Rome, dating back to the tenth century, that celebrated the arrival of spring (page 103). from the breasts of your consolation. The first verse of the chant is from what scholars call “Third Isaiah.” Its composition is dated to the period after the return of the Hebrew people from the Babylonian exile—from the late sixth to the early fourth centuries BC (M. A. Sweeney, “Isaiah,” New Oxford Annotated Bible: New Revised Standard Version , 965). The terrible suffering of the invasion, conquest, and exile are over. The second verse, from Psalm 122, is about the longing of pilgrims to be in Jerusalem, the great city where God is worshiped in his holy temple. 46TH STREET FAÇADE RESTORATION NEWS . . . Milan Restoration is the company the board of trustees has chosen to undertake this restoration of the 46th Street façade of the church. This includes work, not just on the main entrance to the church, but also on the parapets of the Parish House (west side) and the Mission House (east side) of the complex. Milan is hoping that a permit for construction will be issued shortly and that the weather will permit the erection of new sidewalk scaffolding to accommodate the needs of the project on Monday in Holy Week, April 15. They will not be working on Thursday evening through Easter Monday. I hope to have a weekly update for our readers and especially for those whose financial gifts are making this work possible. —S.G. The Rector was celebrant and preacher for the Solemn Mass on March 24, 2019. YOUR PRAYERS ARE ASKED FOR Bonnie, Mara, Cyrisse, Wendell, Donald, Norman, Michael, Rita, Carmen, Daniel, Michelle, Robert, May, Alexandra, Kyle, Karen, Susan, Marilouise, Takeem, and Barbara; for Horace, Gaylord, Louis, and Edgar, priests; for all the benefactors and friends of this parish; and for the repose of the soul of Ron Nash. GRANT THEM PEACE . . . March 31: 1913 Elizabeth Kirby. THE WEEKDAYS OF LENT and the ordinary Fridays of the year are observed by special acts of discipline and self-denial in commemoration of the crucifixion of the Lord. THIS WEEK AT SAINT MARY’S . . . Sunday, March 31, The Fourth Sunday in Lent, Sung Matins 8:30 AM, Mass 9:00 & 10:00 AM, Adult Education 10:00 AM, Solemn Mass 11:00 AM, Solemn Evensong and Benediction 5:00 PM . . . Wednesday, April 3, Sung Mass 12:10 PM; The Wednesday Night Bible Study Class will meet on April 3 at 6:30 PM . . . Thursday, April 4, Mass with Healing Service 12:10 PM . . . Friday, April 5, Evening Prayer 6:00 PM, Stations of the Cross 6:30 PM; Centering Prayer Group, 6:30 PM in the Atrium in the Parish House, Second Floor. AROUND THE PARISH . . . On Saturday, March 30, 2019, at 8:00 PM, The New York Repertory Orchestra will play the fourth concert of its 2018–2019 series. Music is by Bellini, Hovhaness, and Tchaikovsky. The concert takes place in the church. Admission is free, but a $15.00 donation is suggested. NYRO’s final concert of the season will take place on Saturday, May 18, 2019 . . . A copy of the address that assisting bishop, Mary Glasspool, delivered at the recent meeting of the House of Bishops has been posted on the diocesan website. Bishop Glasspool and her wife, Becki Sander, were recently informed that Ms. Sander would not be invited to attend the Lambeth Conference in July and August 2020, though it is the custom to invite the spouses of all bishops attending the Conference. This is Bishop Glasspool’s response . . . The conveners of the Saint Mary’s Centering Prayer Group are considering the possibility of holding a second session, in additional to their Friday meeting at 6:30 PM, on Sunday afternoons. If you are interested, or if you would like to know more about Centering Prayer, contact Blair Burroughs, Renée Pecquex, or Ingrid Sletten . . . We are looking for donations for altar flowers for the Sundays of Eastertide . . . Attendance: Last Sunday 180; Annunciation 138. Father Jay Smith was celebrant and preacher for the Solemn Mass for the Annunciation. FROM BROTHER DAMIEN—OUTREACH THIS WEEK: On Tuesday, in the subway station, I was approached by a young man, who was perhaps eighteen or twenty, who pointed toward the turnstile and asked, in broken English, “Will you pass me?” He had no fare for the subway and wisely chose to ask for help rather than risk the steep fine for jumping the turnstile. It wasn’t much to ask—$2.75 will hardly break the Friary budget for the month. The encounter and the request were ordinary. But the specific word choice, admittedly awkward for the purpose, soon struck me as profound. We are approaching Passiontide and Holy Week, when we will again hear those chilling words from the book of Lamentations, “Is it nothing to you, all you who pass by? Look and see if there is any sorrow like my sorrow” (1:12). These words have long been understood by Christians as prophetic of the suffering of Jesus on the cross. Today, they reminded me also of the immense suffering and sorrow we pass by in our city daily, and of a phenomenon called “compassion fatigue”—we see so much need, so often, that we become numb to it. It is nothing to us, and we pass by. 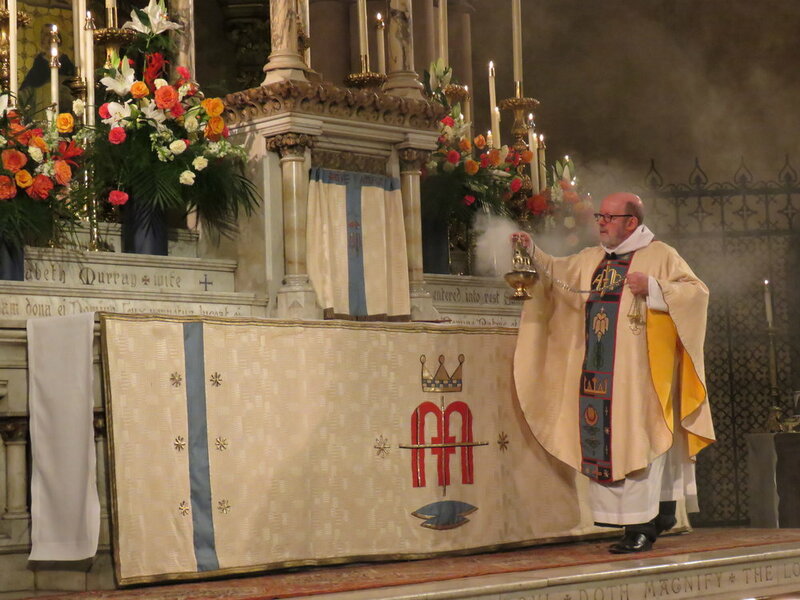 Incense is offered during the singing of Gloria in excelsis. FROM THE MUSIC DIRECTOR . . . The setting of the Mass on Sunday morning is Missa Iste Confessor by Giovanni Pierluigi da Palestrina (c. 1525–1594). Palestrina is often regarded today more as a source and inspiration for many of the composers who followed him than as a practitioner of already established musical practice. However, it may be said that Palestrina stood on foundations largely laid by the Netherlandish composers Guillaume Dufay (c. 1397–1474) and Josquin des Prez (c. 1450–1521). He is responsible for setting the canons for renaissance polyphony and the standards for Catholic liturgical music which pertain even in our time. Among his hundreds of compositions are over one hundred Masses, most of which were published in thirteen volumes between 1554 and 1601. The Missa Iste Confessor is from the fifth book of Masses published in 1590. It is based upon a plainsong melody for the eighth-century hymn for the commemoration of confessors, originally understood as those who had suffered persecution short of martyrdom for their faith. Eventually the category of confessor came to include bishops and others who lived a holy life and died in peace and did not fit into other saintly classifications. The Mode VIII chant melody which Palestrina utilized in his four-voice Mass setting was found at 228 in The Hymnal 1940 with the text “Only begotten, Word of God eternal,” intended for the Consecration of a Church. (That text appears in The Hymnal 1982 but with different music.) Palestrina’s mass is mostly for four voices. As is often the case in Masses of this time the Benedictus has reduced voicing and the final Agnus Dei calls for an additional voice. The flowers were given to the Glory of God by Bishop Charles E. Jenkins III in loving memory of his parents, Don and Helen Jenkins. Palestrina’s works include more than three hundred motets. His setting of Ego sum panis vivus will be sung during the administration of Communion at the Solemn Mass on Sunday. The text is from the Gospel according to Saint John (6:48–51). This text has been chanted as a Eucharistic song for Corpus Christi as well as a canticle antiphon for Lauds on Corpus Christi and for Ember Wednesday. Palestrina’s setting of this text for four voices is particularly suitable for Eucharistic devotion in Lent. CHRISTIAN EDUCATION . . . On Sunday, Father Peter Powell continues his series, begun in November 2018 and resumed on the first Sunday in Lent, on the Elijah/Elisha cycle in 1 Kings 16:23–2 Kings 13:25 in the Sunday Adult Forum at 10:00 AM through Palm Sunday. You are welcome to join us . . . The Wednesday Night Bible Study Class, led by Father Jay Smith, will meet on April 3, when the class will continue its reading of the Passion Narrative in the Gospel of Luke, which is heard at Mass this year on Palm Sunday. On April 3, the class will begin its reading at Luke 22:54, the beginning of the trial before the high priest. HOSPITALITY MINISTRY AT SAINT MARY’S . . . We hope to receive donations to help pay for the holy-day receptions on April 20 (Easter Eve) and Thursday, May 30 (Ascension Day). If you would like to make a donation, please contact the parish office. The total cost of each reception is around $500.00. We appreciate all donations in support of this important ministry. Any and all donations are always used to make up the deficit each year we normally experience in the hospitality budget. When making a donation, please make a note that it is for the Hospitality Ministry, and we thank you. Father Pete Powell (L), Jason Mudd, and Grace Mudd after Mass on Sunday. NEWS OF THE ORDER OF THE HOLY CROSS . . . We recently received a message from our friends in West Park. The Order of the Holy Cross is now accepting applications for its Monastic Immersion Program. They write, “We are now taking applications for our next round of monastic internships. The objective of the internship is full immersion in twenty-first century Benedictine monasticism. Interns experience this by living alongside the community here at Holy Cross Monastery and participating fully in our daily rhythm of prayer, work, and study. The program is available to men and women ages 22 to 35.” For more information, please contact: Br. Josép Martínez-Cubero, Director of Monastic Internships, Phone: 845-384-6660 ext. 3019. Brother Josép can also be reached by e-mail. Please share this information with those you think might be interested in such a program.